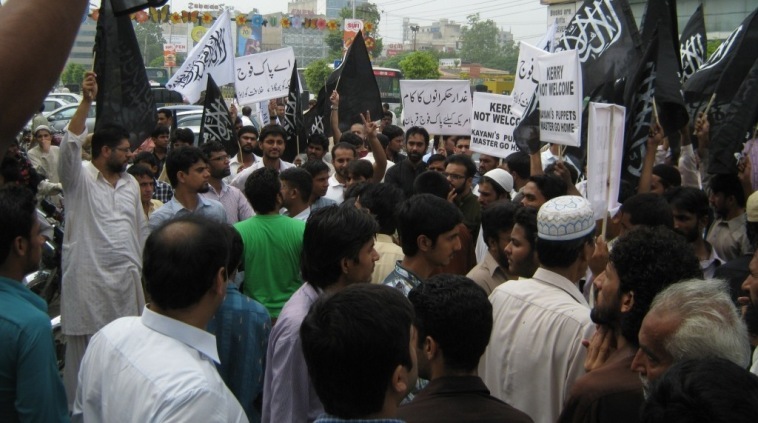 Hizb ut-Tahrir/ Wilayah of Pakistan demonstrated through out the country against the welcoming of US officials by traitors within Pakistan’s leadership to take further orders. Demonstrators were holding banners and placards declaring: “Welcoming US Officials is a sign of treachery”, “O Pak Army! End American Raj, Bring the Khilafah”. Demonstrators protested against any contact, by visit, or cable message or phone call, with the enemy officials. Any contact, by visit, or cable message or phone call, by American and Western officials with traitors in Pakistan’s political and military leadership brings humiliation and hardship for the Muslims, as these traitors receive instructions from their Western masters to safeguard their interests, assuring their achieving of their objectives. The purpose of such meetings is to secure the subordination of Pakistan before India, securing permanent American presence in Pakistan and Afghanistan and to increase their influence, obstruct the establishment of Khilafah and ensure the persecution of those who call for establishing Islam as a ruling system. The history of Pakistan clearly shows that whenever Americas gets closer, Pakistan suffers even more destruction and humiliation. And this is quite evident from the last twelve years experience, where Pakistan being a front-line state in America’s war, has ensured severe losses for Pakistan and its armed forces. Islam forbids such interactions and meetings and Khalifah punishes such betrayal. Hizb ut-Tahrir demands from the sincere officers in the armed forces that they uproot these traitors, who welcome and embrace our enemies in order to destroy us, implementing their evil plans against this Ummah and its armed forces. Hizb ut-Tahrir calls the sincere officers of the armed forces to grant Nussrah to Hizb ut-Tahrir in order to bring an end to the American Raj secure the return of the Khilafah.